File - Recording artist Sevyn Streeter performs onstage during an exclusive "Furious 7" concert hosted by REVOLT Live at Hollywood Studio at Hollywood and Highland on April 1, 2015 in Hollywood, California. The Philadelphia 76ers publicly apologized Friday to the singer who wasn't allowed to sing the national anthem at the team's home opener this week because of her "We Matter" jersey. 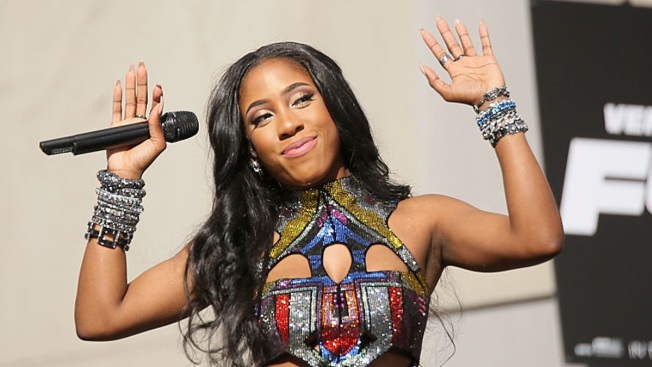 The team said in a statement that they hope singer Sevyn Streeter will come back and sing at the Wells Fargo Center before another game this season. Streeter was supposed to sing Wednesday evening before the Sixers' nationally-televised opener against the Oklahoma City Thunder. The controversy began minutes after she was replaced by a Sixers cheerleader for the pre-game ceremony. Streeter posted a short video on Instagram saying she had been told she could not perform because of her attire. "I'd say two minutes before we were about to walk out ... the organization told me that I could not wear my shirt while singing the national anthem at their game," the R&B singer later told the Associated Press. "I was never given any kind of dress code. I was never asked beforehand to show my wardrobe." The Sixers initially would not say what caused the franchise to keep Streeter from singing. "The Philadelphia 76ers organization encourages meaningful actions to drive social change. We use our games to bring people together, to build trust and to strengthen our communities. As we move from symbolic gestures to action, we will continue to leverage our platform to positively impact our community," the Sixers said in an initial statement.